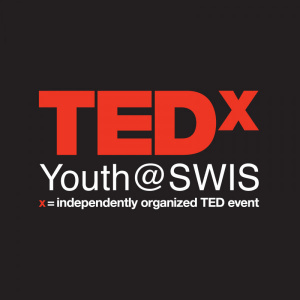 TEDXYouth@SWIS is the first ever youth event to be organized by Shen Wai International School. TEDX is an initiative by TED to give platform to the ideas worth sharing. The theme of the First TEDX event at SWIS is "Glass Ceilings: Breaking Norms" and revolves around breaking the stereotypes and coming up with something valuable and inspiring. Some of our major ideas include the impact of popular culture on the food choices people make and its impact on ecosystem, robotics and gene technology, and lesser-known fields. There is also an emphasis on the importance of breaking language barriers to connect with the rest of the world and how it can benefit an enterprise and an individual. SWIS TEDx event has a equal number of female speakers to male as to spread the message that we live in a world of equality and there should be equal female representation. The theme also focuses on how one can inspire their-self to do something beyond the normal convention and make a rewarding and a satisfying career. This event is an effort to bring out the youth of Shenzhen city to a platform where changing times have got them out of their comfort zone and carved a niche for themselves with a clear objective and motivation. Jennifer worked for an international Shenzhen bank before joining her family business. She was in-charge of foreign exchange business, import and export financing, corporate and syndicated credit. Jennifer is one of the first locals to become a senior manager of a foreign bank in Shenzhen. Sitong Sheng is the brain behind the HYK gene sequencing company. HYK Gene was officially established in Shenzhen in 2008 but the R&D began before, while he was doing research at his own laboratory in Charlottesville, Virginia. Sheng already had an idea to start a company and commercialize the technology but didn't know if it was better to do it in the US or in China. Encouragement of the then-Minister of Health of China, Minister Chen Zhu, helped Sheng to take his novel technology to China to establish a truly Chinese innovative gene sequencing company – with its own independent intellectual property rights and patents. Sheng was therefore invited back as one of the first batch of China’s ‘Thousand Talents Plan’. HYK Gene is a product company. While China is now a global giant in the field of genome sequencing, the vast majorities of players here do not have their own products but rather, act as users or distributors for foreign products. Zhaoxu Nan moved to Shenzhen in 1980s. In his young age, Zhaoxu Nan worked and taught in universities. Starting from mid -1990s, Zhaoxu Nan started to explore and do natural research at various mountains, rivers and seashores in and around Shenzhen. He also trod over villages and rural areas, discovering, analyzing and documenting what he saw and researched from the perspective of a writer, a teacher, and a publisher. Yi Dai - Shenzhen Overseas High-level Talent (Peacock Project), Senior Engineer. In 2012, Yi Dai served as the Managing Director of Shenzhen Bominwell System Engineering Co., Ltd. .In 2014, he founded Shenzhen Bominwell Intelligent Technology Co., Ltd., serving as the Chairman and Chief Technology Executive Officer, and is responsible for major technology development within the company. This year, Dai received the Science and Technology Innovation Individual Award in Shenzhen Longhua New District. In 2015, he was awarded the Overseas Personnel Innovation Fund set by the Shenzhen Science and Technology Innovation Committee. Having received several Science and Technology Innovation Individual Awards in the city, Dai’s company has its multi-functional special robot platform “Dinosaur” was awarded the featured products of Shenzhen Longhua New District in 2015. Bominwell's Peek series periscope is currently the most advanced homogenized product in China. Bominwell is also a leading company in China specializing in vascular network detection robots and cloud platform management systems for urban underground space. Using robots to improve urban security, has always been the goal of Dai and his company. David Liu is a user experience practitioner, graduated from University of British Columbia with a degree in Engineering and Commerce. David has more than 15 years of experience in user experience design and management across various sectors: E-commerce, Search, Information Security, Education and Charity. David also actively participates in volunteer consulting and various charity activities. 11.50 a.m. – 12.10 p.m.